Enjoy 30% off the MSRP Price! Read on to learn More about each of these tools. 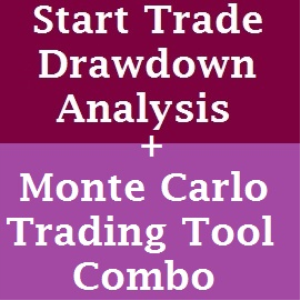 Maximum Drawdown is the most often viewed performance metric when determining trading system/plan capitalization. With Start Trade Draw Down Analysis you can determine a more appropriate allocation based on probabilities. Along with a short white paper an Excel based VBA program is included so that you can calculate the Cumulative Distribution Function of your own trading system or plan. The key to this form of simulation can be found in random numbers. Once you develop what you consider a good trading algorithm and test it against historical data you then can put it to the test by using random numbers and the historical trade history. This trade history that is generated by testing your algorithm represents just one path your system travelled. What if you could create many paths by jumbling the order of the trades that your algorithm generated. These different paths could represent alternate universes. Let’s say that your algorithm got lucky and had a bunch of winning trades in a row. This streak might be the portion of the equity curve that pulled the system out of mediocre status. If these trades didn’t exist or hadn’t fallen in place like they did, then the equity curve might look quite a bit different. A robust trading system should still produce robust performance metrics even when the trades are jumbled, some eliminated and some duplicated. If a clear majority of alternate paths of an algorithm fail to produce good metrics, then the algorithm should be considered suspect. Creating alternate paths or parallel universes is a very simple process when you have access to a random number generator and a computer. Imagine all the trades generated by your algorithm are each written on a separate piece of paper and all the pieces are then placed in a bag. You create an alternate trade history by reaching into the bag and randomly selecting trades and writing them down in a trade log in sequential manner. You do this routine until you have recorded the same number of trades that were initially generated by the back test. One very important thing to remember is to always return the piece of paper to the bag after you record the trade. This process would be very time consuming and you might ask what’s the use. Don’t worry about the time involved because the computer can do it very quickly and recreating hundreds of alternate paths is well worth the effort. The following chart illustrates 100 alternate equity streams. This chart shows a profitable trading system that demonstrates a relatively high level of robustness; much of the equity curves are above the zero line and there is a fair share of the curves “clumping” together. All VBA code is included in the trading tool.